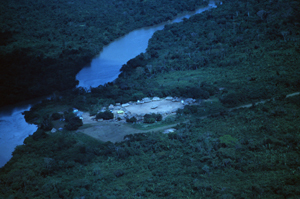 Iasis have made several trips to Brazil, to the indigenous tribes living along the Xingu river within the rain forest. The tribes are very different from each other. They have had a very difficult time because the loggers are very nearby undertaking de-forestation. A few years ago they lost a lot of children to chicken pox because they had no immunity to such viruses imported into the forest by the loggers. That was one of the motivations for being involved in a medical project there. On one visit to one of the remotest regions, we found that most of the children had pneumonia. They had an inexperienced nurse there, but she was overwhelmed by the number of sick children in her care. Most of the villages or groups of villages have a nurse, who is Brazilian. Each nurse could have up to 400 people in his or her care. She is usually based in the biggest village and then travels out to peripheral villages by canoe. The nurse we met was really worried about a baby when we arrived. The baby was about ten days old, and desperately ill with pneumonia. He was pale and lifeless. We thought he could die at any moment. We had taken only basic medical equipment with us. We had some oral rehydration fluid which we dripped into his mouth, and we gave him antibiotic injections every four hours. He made it through the first night and by morning he was a bit better. In the afternoon we managed to get a radio message out to the nearest town, and he was evacuated to the nearest hospital. The next year we returned to the village, and he was there. His parents had him Aroy and he had long black, beaded hair. The parents presented him to us and said “Aroy is our Indian name: it means ‘The doctors who save our lives’.